When my son graduated from high school, we moved from Massachusetts to Chicago. He was delighted that we would not be attending his graduation. He didn’t want us there to embarrass him. He had made it clear we were not invited that it would embarass him. He did allow us at the awards event. Mighty gracious of him, I think. He was seventeen and by that time we were used to how things worked. We’d moved him from Chicago, to Texas, to California, to Massachusetts, and now we were taking him back to Chicago right before he left for college in Washington, D. C. He knew Chicago well enough. He’d spent every Christmas and summer vacation here visiting his grandparents since he was four. Still he was being uprooted again. I expected a certain amount of misbehavior, a certain time of adjusting. Then too, there was the natural breaking away from the parents stuff, that and the moving, but I still wasn't prepared for the stuff that I got. I had been in Chicago working and living, when my two men arrived the day after the movers. They drove crosscountry in separate cars, communicating by telephone, meeting at restaurants and hotels along the way. I think they knew they weren’t fit to be in the same space for long periods of time. Of course they didn’t share these glad tidings with me. We were at the stage of young lion, old lion. There's only room in this town for one of us. I found myself moved from a hotel existence to living in 1200 square feet with 2 introverts, both of them at DEFCON 5 ready. One of them would think and the other would shoot. Stress was high from the move. This fight for who ruled the pride raised it exponentially. I tried talking to each of them. Amazingly, both sounded sane. If only they were in the same reality. I had no words, no amount of explaining that could make that change. I finished getting ready for work and picked up my briefcase, preparing to leave our 12th floor condo. “ I promise I won’t throw him out the window today,” my son’s father said. Personally, I would have wished if my parents could have gone to my H.S. graduation in my stead. There's too much ceremony when the actual useful portion lasts all of ten seconds. It never ceases to amaze me that grown men can't rest assured that they have already won, that the younger wouldn't be quite so forceful in his complaints if he didn't feel he was up against a formidable opponent. They end up like TWO teenagers, both being as intense as each other and then it escalates, because neither can see the cracks in the other one's armour. Big hugs - its completely normal, unfortunately! Our son doesn't mind other people looking at him, just not the ones he cares about. At least he was then. "I'm right and you're wrong! Even if you are the parent and think you know better. Even if you've lived longer and experienced more than I have!" CAn you believe those words once came out of my mouth...well I thought them...But I'm sure my parents knew exactly what I was thinking. I straightened myself out though. One things you didn't know was that your parents knew it was possible that you could have been right. Thanks, it's fun telling these stories. I'm pleased that you like hearing them. This morning seems to be a good one. I'm hoping your day is as bright as mine seems to be. This reminds me of how upset I used to be that my son wouldn't let me leave him at preschool- I had to stay there with him. He was definitely a clinger. I didn't force him to separate before his time, based on books I'd read on the topic... My behavior was viewed as extreme by the teachers and other parents. I just wonder if his future breaking away will be equally intense. It's a daunting thought. Thanks for the warning. As a single parent, I'll probably be the standoff opponent. Or partner. They have to find a way to break the umbilical cord and it's just not pretty. I hope that yours does it gently because of the close bond you have together. Either way, you can't help but get here one day, God willing. You'll live through it and have your own story to tell. I'm sure of it. Oh boy. I've seen this old lion/young lion so much that it's more than annoying. Loved your idea at the end though - LOL. Hope your computer is well and the book is in tact. Yeah boys will be boys. Your versatility is amazing. That was really funny. Your blog is like a box of chocolates. Thank you for you comments on my versatility, and those on the story. It is a fun story. 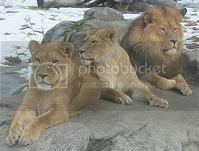 BTW - we must be on the same astral plane or something today, we both used pictures of lions in our latest blog posts! Mine lions are at my LiveJournal. Yeah, it's hard saying good-bye to the little boy and hello to the man. Hard on him as well, I'm sorry to say. Lions at your place too? hmmm wonder what's in the water? When my son attended high school and needed a ride in, I had to drop him a good eight of a mile away from the door least any of him friends might see me. I found it an amusing aspect of growing up. To establish his own individuality, he had to seperate from me, but once he became his own person, I can drop him off right at the door of anywhere he may need to go. Old lion, young lion makes a fitting analogy for such a peculiar dilemma more commonly referred to as teenage angst. There is a special bond between a father and a son that no mother will ever cross or understand. I see it when you write about yours or the one that's here.